We are instrumental in manufacturing and supplying quality Fail Safe Brakes. 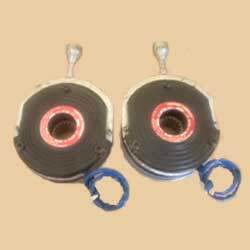 Our Fail Safe Brakes are widely appreciated for their efficiency and smooth functioning. Designed with precision engineering, our Fail Safe Brakes are available in varied designs and finish. Moreover, our Fail Safe Brakes are priced very moderately. Brake motors, Hoist & Cranes, Lifts, Storage & retrieval systems, Navy deck machinery, Textile Machinery, Â IR telescope for satellite tracking, Tire machinery, Printing Machinery, Defense equipment, Steel plant Â Machinery, Marble / Granite Machinery, Industrial Presses, Power operated gates, Wood working Machinery, Industrial Robotics, etc. These types of brakes require DC Voltage to release. Switching can be done on either side. However for higher cycle time / faster engagement & disengagement, switching must be carried out on DC side only. To protect contactor points, coil & switches, resistor and capacitor networks must be provided across the contactor to restrict the high restrict the inductive voltage/brake EMF which is produced when power is switched off.